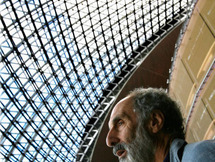 Paul Andreu (born July 10, 1938 in Caudéran) is a French architect, best known for his designs of airports worldwide, notably in Manila, Jakarta, Shanghai Pudong, Abu Dhabi, Dubai and Paris. Andreu was educated at the École Polytechnique in Paris where he graduated in 1961. 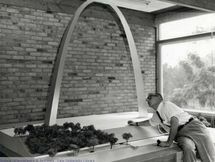 Eero Saarinen (August 20, 1910 – September 1, 1961) was a Finnish American architect and furniture designer. He emmigrated with his parents to the United States from finland in 1923 at the age of thirteen. 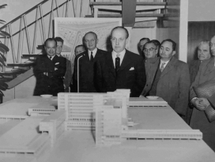 He grew up in Bloomfield Hills, Michigan, where his father, the architect Eliel Saarinen,.. The TWA Flight Center or Trans World Flight Center, opened in 1962 as the original terminal designed by Eero Saarinen for Trans World Airlines at New York's John F. Kennedy International Airport (JFK). 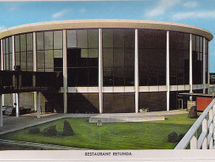 Portions of the original complex have been demolished, and the Saarinen terminal (or head..
Washington Dulles International Airport is a public airport in Dulles, Virginia, 26 miles (41.6 km) west of downtown Washington, D.C. 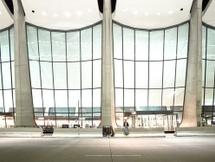 The airport serves the Baltimore-Washington-Northern Virginia metropolitan area centered on the District of Columbia. It is named after John Foster Dulles,..
Vann Molyvann constructed 1963 the VIP Pavilion at the former Siem Reap domestic airport, with its jutting V-shaped glass walls, inspired by Frank Lloyd Wright. The building was demolished and only few examples of the influential Cambodian architect’s work still remain in Siem Reap domestic.. 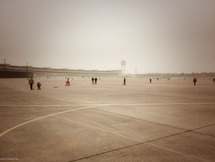 Planned and nearly completed during the National Socialist era, the construction of the Berlin-Tempelhof Airport was meant to be consistent with its role as a “world airport”, but also to serve as a propagandistic expression of the Nazi regime's self-image. The design of Tegel Airport is based on a triangular grid and is echoed in the elevation: the ordering principle for both structure and technical installations is the geometry of the triangle. The concrete shell is left exposed both inside and outside. The structural "skeleton" of the building.. 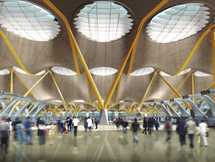 The New Terminal Area (NAT), designed by a consortium of Richard Rogers Partnership, the Spanish practice Estudio Lamela and two engineering companies TPS and Initec, will establish Madrid as a major European hub, and consolidate its position as the focal connection between Europe and Latin.. The new built airport is part of Georgia's ambitious plans to develop tourism in Mestia. The beautiful medieval town with its stone defensive towers is part of UNESCO's list of World Heritage Sites and also famous as ski-resort. 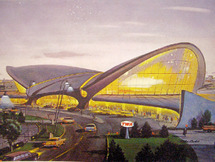 With the unveiling of the airport on December 24th the building was.. 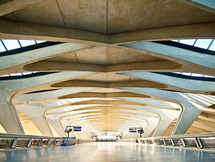 The first terminal, designed by Paul Andreu, was built in the image of an octopus. 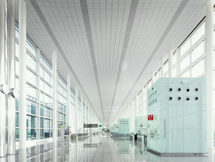 It consists of a circular central part housing central functions like check-in and baggage claim. Seven satellites which are connected to the central building by underground walkways contain the gates. Lyon–Saint Exupéry Airport (French: Aéroport Lyon Saint-Exupéry), formerly known as Lyon Satolas Airport, is the international airport of Lyon, the third-biggest city in France and an important transport facility for the entire Rhône-Alpes region. 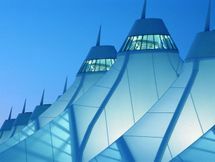 Gare de Saint-Exupéry TGV (formerly Gare de..
Denver International Airport (IATA: DEN, ICAO: KDEN, FAA LID: DEN), often referred to as DIA, is an airport in Denver, Colorado. 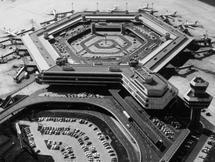 At 34,000 acres (53 sq mi), it is the largest airport in the United States by total area. Runway 16R/34L is the longest public use runway in the United States. 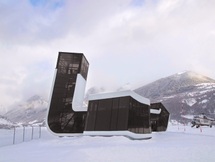 In 2013,..
Curtis Fentress, FAIA, RIBA (born 1947), an American Architect, is the Principal-in-Charge of Design at Fentress Architects, an international design studio he founded in Denver, Colorado, in 1980. Fentress Architects also has studios in Los Angeles, California; San Jose, California; Washington,.. 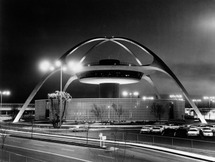 The Theme Building is an iconic landmark structure at the Los Angeles International Airport within the Westchester neighborhood of the city of Los Angeles. 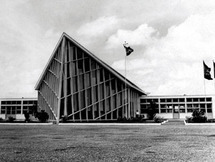 Construction began in April 1960 and was completed in August 1961 at a cost of $50 million. The Barcelona 1992 Olympics Games required refurbishing and expanding the existing terminal to provide the city with a modern gateway for visitors and athletes. Barcelona Airport was subjected to a major remodeling operation in order to prepare for the leap in capacity from six million.. 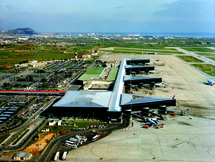 The opening of Terminal 1 at the Barcelona Airport solidified Barcelona’s position as one of Europe’s top ten airports. 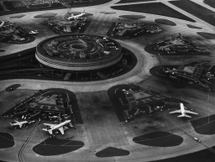 Situated between the Mediterranean Sea and the existing Terminal 2, completed in 1992 for the Barcelona Olympic Games, T1 was conceived as a singular dynamic space under a huge..
Maxime Brunfaut was an important Belgian architect and urban designer. He was the son of Fernand Brunfaut , also an architect and representative for the Belgian Workers Party. From 1925 to 1929 Maxime studied architecture at the Academy of Fine Arts in Brussels also under Victor Horta. 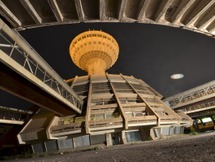 After his..
Zvartnots International Airport is located near Zvartnots, 12 km west of Yerevan, the capital city of Armenia. 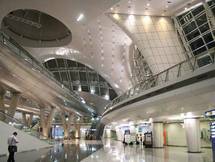 It acts as the main international airport of Armenia and is Yerevan's main international transport hub. It is the busiest airport in the nation. The airport was built in 1961. An open..